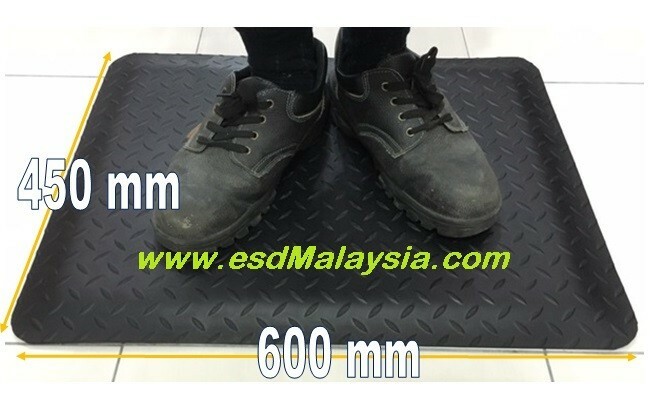 ​( Electro-Static Dissipative Anti Fatigue Mat ) are made of synthetic rubber designed to provide comfort and reduce worker fatigue when used in static sensitive environment. The bottom surface is made of foam / sponge type and has a good function to release the stress of the legs ,but also gives a pathway of static electricity charged in human body to ground. 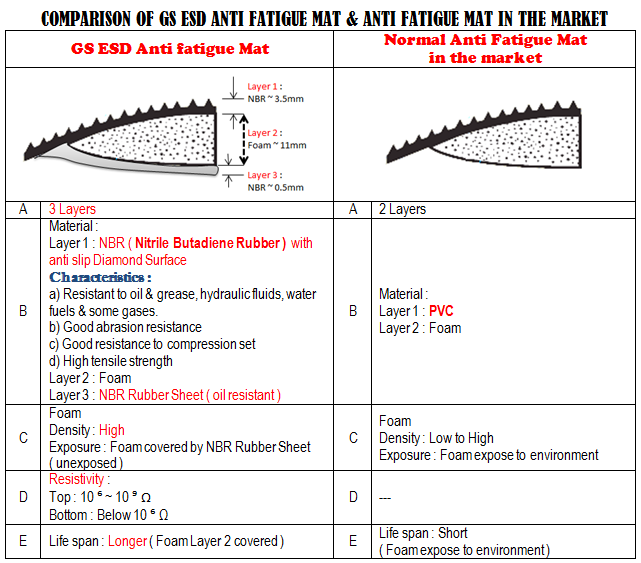 ​​What are ESD anti-fatigue mats ? 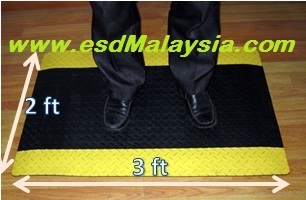 The mats are designed to reduce fatigue that is caused by standing for long periods on hard surface (e.g. cement floors). Fatigue-reducing mats can be made of various materials including rubber, carpeting materials, vinyl, and wood. •Changes in working/standing position: Work should be organized so that the worker has some choice about his/her working position and an opportunity to change position frequently. A workplace that includes an optional seat (chair, sit/stand stool) and some kind of footrest increases the variety of body positions and encourages frequent changes between them. •Footwear: Footwear is a factor which, if properly chosen, may further reduce the harmful effects of prolonged standing. There is no doubt that the choice of footwear is an important consideration for people who work on their feet. Shoes should ensure adequate arch and heel support and cushioning while providing comfort to the wearer. •Flooring: The type of flooring used in the workplace has an equally important influence on comfort, especially on tender feet. Hard, unyielding floors, like concrete, are the least comfortable surface to work on. Walking on a hard floor is similar to the impact of a hammer pounding the heel at every step. Wood, cork, carpeting, or rubber - anything that provides some elasticity - is gentler on workers' feet. More than that, softer floor coverings reduce fatigue and improve safety by reducing slips and falls on slippery floors. 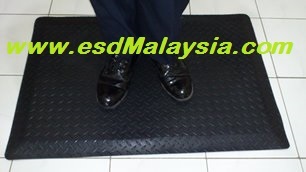 1) ESD Anti fatigue Mat is suitable for assembly lines and other workplaces to reduce individual workers' fatigue from ​long-standing jobs. 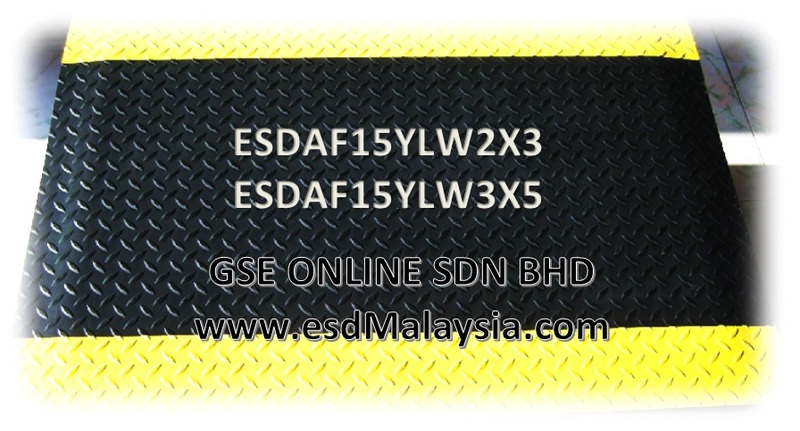 The top surface ( NBR rubber ) is resistant to oil , acid and alkaline & Resistivity readings at 10e6 ~ e9 ohm. 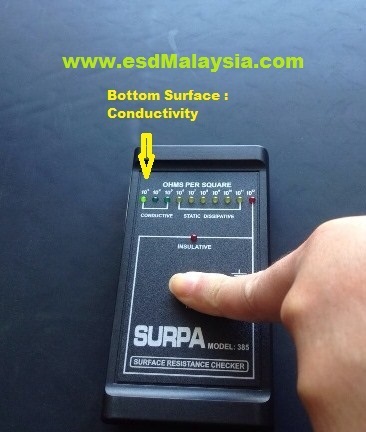 Bottom sponge resistivity is less than 10e6 ohm & produce typical rubber product odour . 3) Available in Yellow border / Black color OR Whole Black colour mat . ​Electronic Manufacturing, Pharmaceutical Plants, Cleanrooms, Fiber Optics, Electronic Assembly, Electronic Warehousing, Circuit Assembly, Aerospace and Hospitals.